I have just purchased a pair of Chinese porcelain vases that are a mirror image of one another. I didn't pay much for them and assumed they weren't authentic, but bought them because they were beautiful and quite interesting. I was told they are probably Chinese Export vases made in the 1950s. I am interested to know whether you might be able to tell if they are indeed Chinese and made in the 50s. Also, I am very curious to know what the story is about on the reverse. You may not even be able to see the writing, however. I was told the image on the front is of "Geishas passing the time with a game of Go." If you might know if these perhaps (by a long shot) were authentic, I would love to know. I would also love to know their value. I was told they are signed by the artist. If you were told the vases were made in the 1950s the seller were not altogether wrong. I have consulted a friend of mind, Simon Ng in Hong Kong, regarding these vases for a translation and an opinion on the poems on the reverse side of the vases. Vases in this style have been made over a long period of years but we both feel that this combination of enamels and borders should pretty well date this pair to the 1930s-40s, which is basically a good period for later porcelain. For the date we need to consider the mark, the style of the decoration as well as the quality of the poem, which might be hard for most westerners. As a general rule this nice vases, with well drawn faces on the figures and better standard of the poems, belongs to the 1930s to 40s. 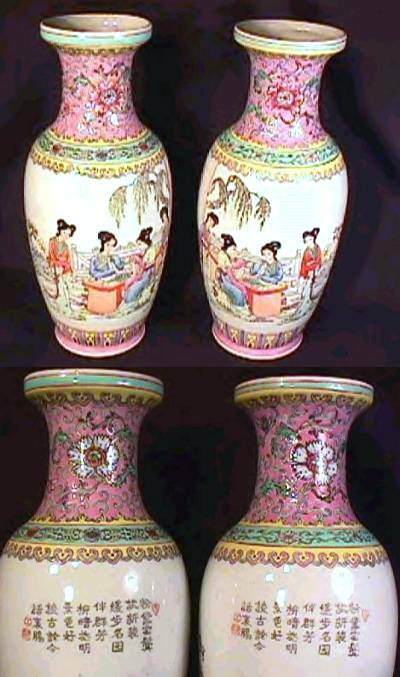 Similar vases from 1950 to 1965, 1966 to 1975, 1976 to 1990 or 1990 to 2000 periods would have other characteristics. The young pretty women are having their hair done and are putting on their newly made dresses. Accompanied by graceful young women from famous homes, they move in small steps. The scenery is charming with quiet willows and bright flowers. From ancient to modern, they chat with cheerful hearts. The translation of the poem and comments on style and form are gracefully submitted by Simon Ng, The City University of Hong Kong.